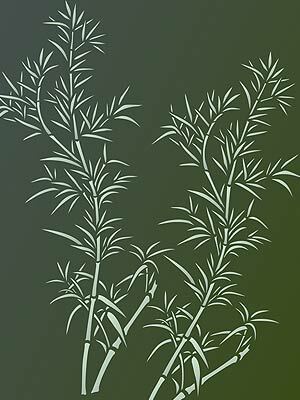 The beautiful Graceful Bamboo Stencil depicts soft plumes of graceful bamboo leaves on a gently tapering stem. 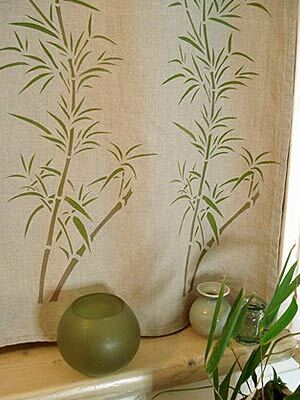 This versatile bamboo stencil is perfect on household accessories – boxes, frames, cushion covers – and on curtains and bedding and on walls as a single or repeat motif. Also includes a small abstract calligraphy script motif. 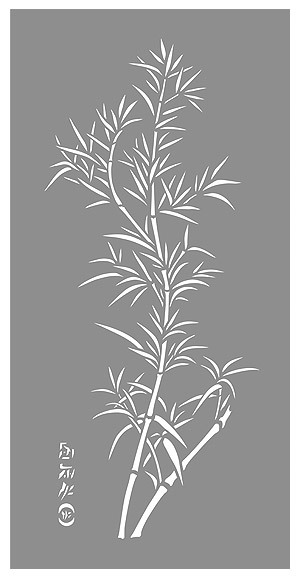 The Graceful Bamboo Stencil is a single motif one sheet medium sized stencil – see size and layout specifications below. Above and top – sections of the Graceful Bamboo Stencil stencilled onto a small wooden planter and picture frame in Willow Stencil Paint, blushed with Antique Gold Metallic Stencil Paint. 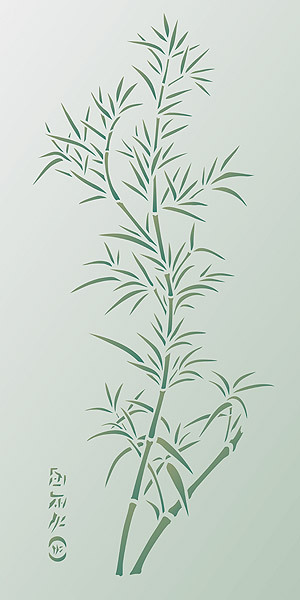 Above – Graceful Bamboo Stencil shown in Hedgerow and Woodland Stencil Paint on a soft green background. Above – Graceful Bamboo Stencil beautiful in golden hues of Yellow Ochre, Sienna and Olive Grove Stencil Paints. 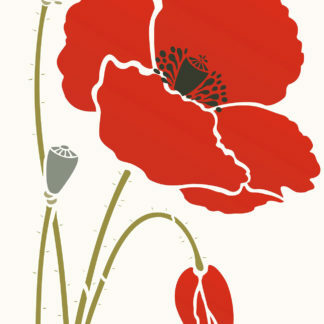 This design lends itself to a host of colour palettes – stencil in green tones and ochres on a range of coloured backgrounds or use traditional Chinese colours of gold on black or vermilion red backgrounds, or black on gold or red backgrounds. Either muted or strongly contrasting colour palettes suit this design’s contemporary and ageless character. 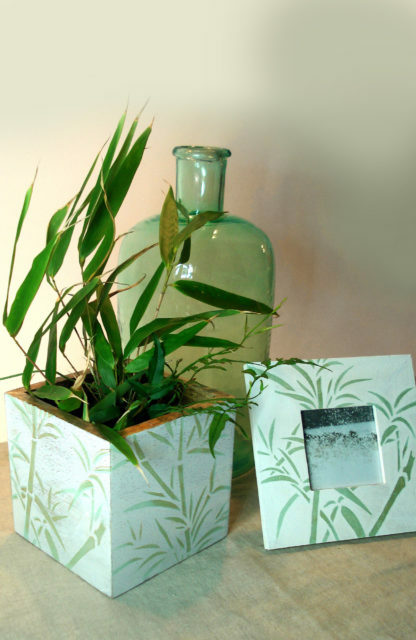 Oversize Bamboo & Moon Stencil – oversize bamboo motif with moon. 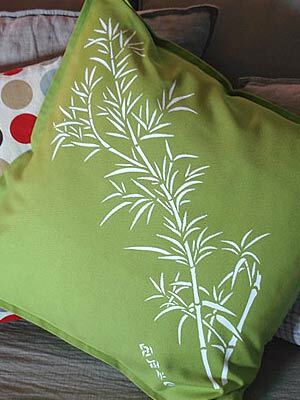 Large Chinese Bamboo Stencil – striking bamboo design. 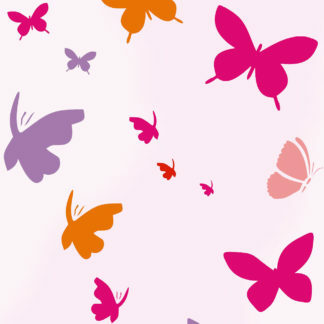 Bamboo and Butterfly Stencil – small motif stencil. 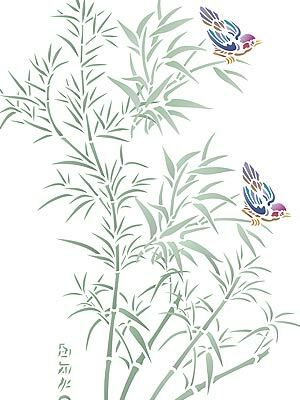 Bamboo and Bird Stencil – small motif stencil. 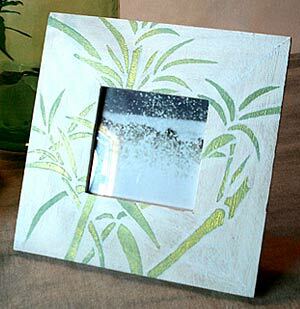 Bamboo and Water Swirls Stencil – weeping bamboo design. 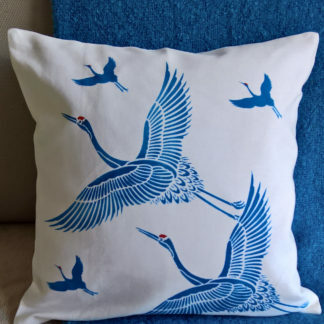 Above – the Graceful Bamboo Stencil striking in Pure White Fabric Paint on a lime green cotton cushion cover. 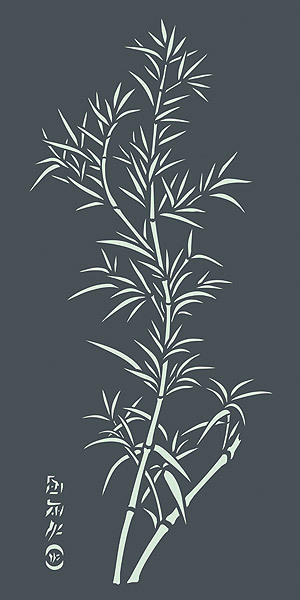 Above – the full motif of the Graceful Bamboo Stencil shown in Spearmint Stencil Paint on a dark green-grey background. 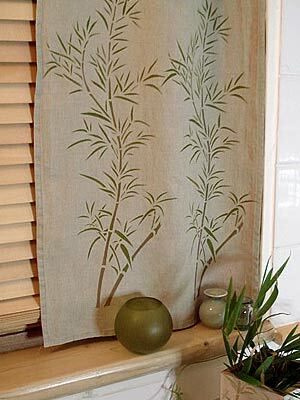 Above and below – the Graceful Bamboo Stencil has been repeated at the bottom edge of a linen curtain panel. Stencilled in Olive and Taupe Fabric Paint. 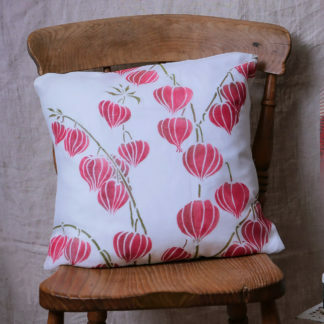 Stencilling onto fabric is easy. Apply repositionable spray adhesive to the reverse of the stencil, lay the stencil onto your fabric on a protective sheet of paper and stencil with our Fabric Paints and Stencil Sponges. Our durable Fabric Paints are colourfast when ironed on reverse side with a hot iron. Above – Graceful Bamboo Stencil shown in Storm, Arctic Grey and Indian Purple Stencil Paint on a soft lilac background. 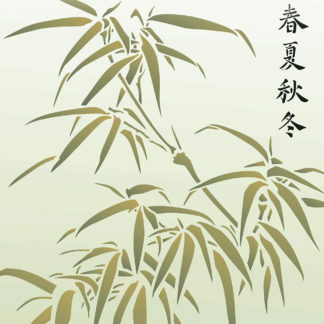 Above – the Graceful Bamboo Stencil repeated at different angles, in Spring Vine Stencil Paint on a dark green background. 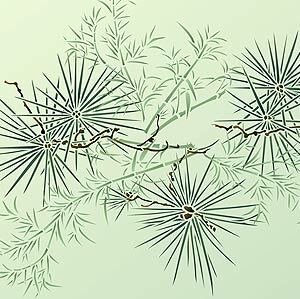 Above – the Graceful Bamboo Stencil with the beautiful twigs and needle clusters of the Japanese Larch Stencil. 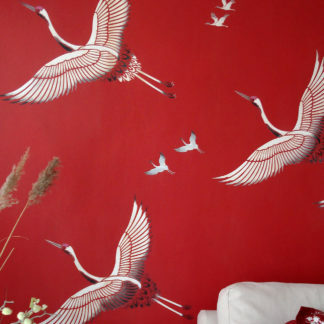 Above – the Graceful Bamboo Stencil and the Bamboo and Bird Stencil. 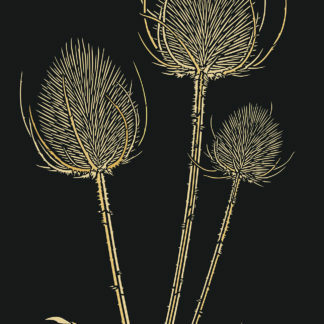 This simple single sheet stencil is made of 125 micron mylar. 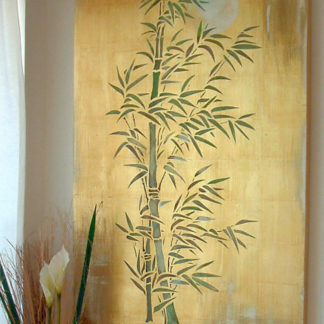 The bamboo motif measures approximately 53.5cm (21″) high by 23cm (9″) wide. Sheet size 60cm (23 1/2″) tall x 30cm (11 1/2″) wide. Left – the layout of the Graceful Bamboo Stencil sheet.